Posted: November 11, 2014 | Author: thelondoncolumn | Filed under: Conspiracies, Crime and Punishment, London scandals | Tags: Brixton riots, David Hoffman, East London Photomonth, G20 protests, Poll Tax Kiss, Roman Road Cafe Crawl, social unrest in London, Stop the City, Swamp 81 | Comments Off on David Hoffman polices London. 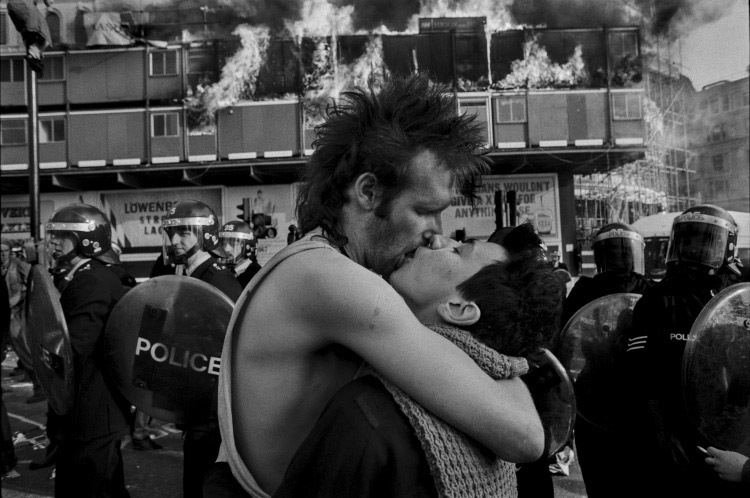 Poll tax riot kiss © David Hoffman 1990. I’ve been fascinated by photographs for as long as I can remember. The school darkroom was a welcome teacher-free refuge. 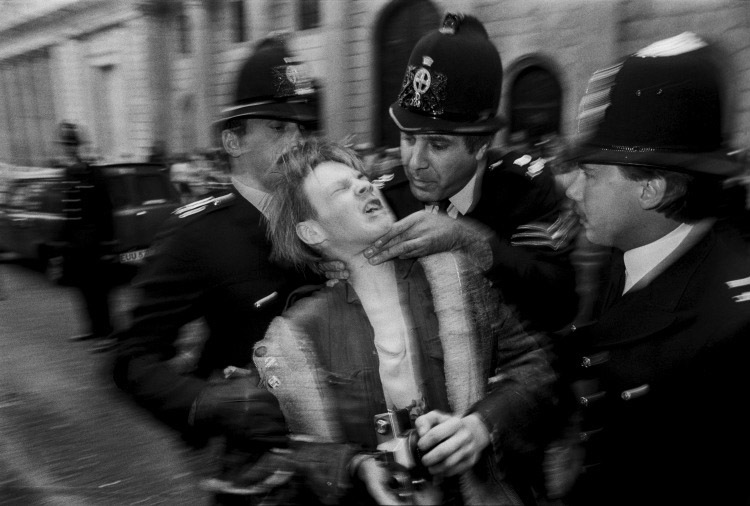 In my teens my first published photo was of an arrest outside Parliament. I got paid three guineas! About £100 in today’s money, rather more than they’d pay today. But then I got distracted by truck and van driving and a bit of education until I started taking photographs in earnest in 1976. 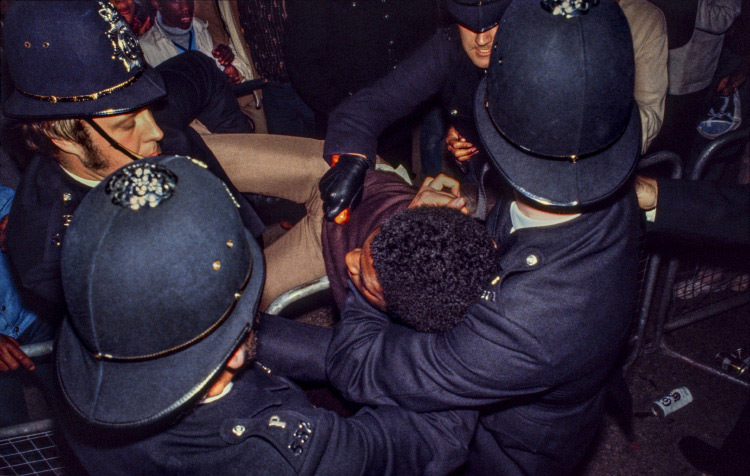 I’ve only been photographing social change and protest for 38 years, but even in my time I’ve seen massive changes in the way that protest has been policed. 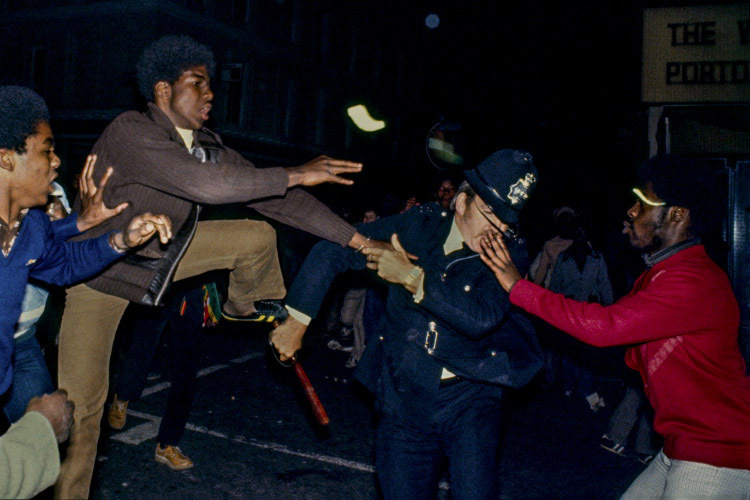 Youth faces police during the Brixton riots. © David Hoffman 1981. It seems to me that police lost their sense of direction in policing protest after the wave of anti-Thatcher riots that swept across the country in 1981. Rather than understanding and adapting to social change, the police responded by opposing it and trying to prevent it. Since then, attempts to control and contain protest have led to growing antagonism on both sides, and an escalation of conflict between activists & police. This has created a vicious circle with suppression of protests leading to angrier, more determined protests. That in turn has been seized upon to legitimise a more military style of policing with shields, body armour and Tasers now standard items in the police kitbag. The police have tremendous power to assist or to stifle protest. It is their actions that determine whether a protest is peaceful or violent. With that power comes an obligation to be open to scrutiny and to be visible and accountable. But what we have seen is very different. The police have formed multiple secret undercover units, they have stepped up surveillance on responsible citizens working for a better society, they have built a network of secret databases and have done all that they can to undermine movements for social change. As the police have become more involved in shaping protest, so it becomes even more important that their actions and behaviour are openly reported. G20 police officer, and protestor on ground. © David Hoffman 2009. I took this photograph as this protester was knocked to the ground by police and was, I believe, about to be punched by the officer shown. As my flash went off I saw the officer visibly restrain himself and in the event the man on the ground was not hit. I’ve seen countless brutal and unjustifiable assaults on passive protesters, but my role at protests is as a photographer, documenting the events – not intervening directly. The more dispassionate I can be, the stronger and more useful I think my pictures become. Photographers trying to record the process of social change are under pressure from both sides. Attacks on protesters are bad enough – but attacks on working journalists are attacks on democracy and on society’s ability to make informed decisions. Showing these processes in action is all too often seen by police as criticism and an attempt to constrain their activities. In response the police have targeted photographers, who have found themselves stopped, harassed, assaulted and surveilled, with their activities logged on secret databases by special units. At the same time protesters increasingly see photographers as ‘spies’ for the police or as reactionary propagandists working for an unloved and untrusted press. Black arrest, hidden truncheon. © David Hoffman 1979. Youths Attack PC. © David Hoffman 1979. I grabbed that photo as more police arrived and the attackers ran off. So the hyped-up police beat me to the ground and tried to grab my camera. That sort of set the tone for the next 30-odd years. 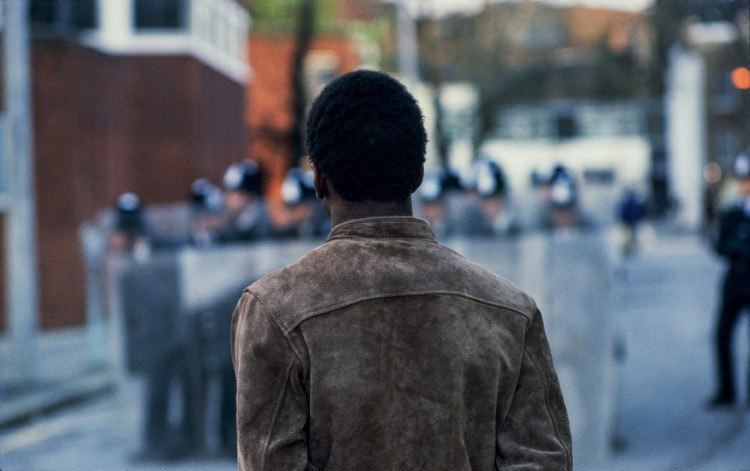 The 1981 Brixton riots started because of just this mistrust of police. It was brought to a head by the pressure of Swamp 81, a heavy-handed racist stop-and-search operation specifically targeting black people. The riots caught the police unprepared. It was the first time I’d seen police in retreat. They had almost no shields or protective clothing, just pointy hats and dustbin lids grabbed from the street. Fear and desperation led police to an ‘anything-goes’ attitude. The police behaviour was uncontrolled and outrageous. At night they went out hunting. I slipped through a cordon and was standing with a group of nervous police by an alley off Coldharbour Lane when I saw this group of police in civvies carrying homemade weapons – pickaxe handles, a heavy chain. They didn’t look like police. I heard one cop ask “who are these thugs?” and another replied “It’s OK, They’re our thugs.” I snapped off just one frame before I was firmly ‘advised’ to stop. A moment after this police group passed me, all the street lights in the alley went off, and they disappeared into the darkness. A moment later I heard screaming and thudding as these policemen laid into anyone they could find. Anyone. Young men and women staggered out bleeding. There was no attempt to arrest anybody, it was just an exercise in violently beating people off the streets. Stop the City demonstration. © David Hoffman 1983. A couple of years on, 1983, still 25 years before the banking crisis and the credit crunch but the anarchists of the ‘80s were well ahead of the game with the first Stop the City demo – a protest against globalisation, big business and the banks. The police sergeant here is strangling a protester who had photographed him strangling another protester. Then he dropped this guy and thought he’d strangle me. It was just that sort of day. Behind that picture lies a revealing story about just how far some cops will go for no reason but the enjoyment of their power. I’d been around from about 7 o’clock, sharp as a rubber razor and so bleary as to be near invisible. I was hanging around by the Bank of England when Kieran – he’s the one getting his neck squeezed – saw this sergeant doing his thing on the neck of yet another chap. So Kieran takes a photograph. The sergeant spots him. A moment later the sergeant has dropped the first guy and is moving in on photographer Kieran. The long fingers of the law wrap around his neck. Of course I’d not noticed any of this. But I did notice a group of three cops making off with their prey in my direction. I continued to gaze vacantly into space until they reached me. I raised the camera and fired off three quick frames. Then I ran away, jumped a cab and got the film away double quick. Meanwhile the sergeant and his mates had dumped a half unconscious Kieran in the gutter and set off looking for me; but I was well away so, disappointed, the cops plod their way back to the gutter, re-nab the still dazed Kieran and off to the nick with him. Job well done. Well, not quite. Kieran was charged – assault on a policeman’s fingers with his throat or something. In court the sergeant said “I never touched him” and claimed that my photograph was a fake. The prosecution called in an expert from Scotland Yard who took just seconds to confirm that the image was genuine and unaltered. Keiran was acquitted. He sued the police, got £4,000 and formed a punk band. 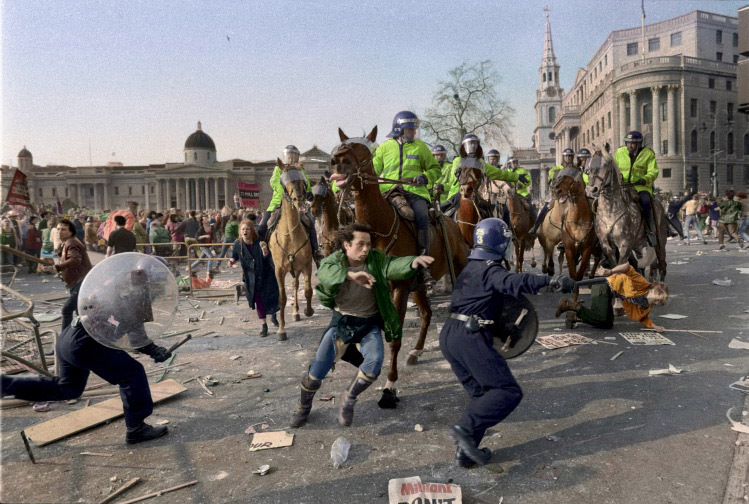 Poll tax riot, mounted police, Trafalgar Square. © David Hoffman 1990. 1990 saw the Poll Tax protests, a series of demos which got more and more angry with Thatcher and with the aggressive policing. There were major protests in Brixton, Hackney, Islington, and finally Trafalgar Square. What I found interesting was how the police dealt with the angry crowd. In every case the police had the crowd contained, and had the opportunity to disperse the protesters into open spaces nearby. Instead, they chased them violently towards high-value shopping areas. This time I had no trouble from police. There seemed to be a deliberate plan to ensure that there would be photos of looting & smashed shops for the next day’s papers. That can only have been a high-level decision intended to move debate away from the Poll Tax and to discredit the protest. Once or twice might possibly have been explained as poor decision-making, but with military precision this happened at every one of those five protests. Over the 24 years since the Poll Tax riot the police have been used to suppress and prevent protest to an ever greater degree. This has encouraged the belief within the police that it is they who own the streets, not us. Excessive force has not only gone unchecked – it has been endorsed by court support for ever more oppressive interpretations of the law. A closed, un-self-critical police culture leaves individual officers with little choice but to support their colleagues, even in gross breaches of the law. The above text was taken from a talk David Hoffman gave at the London College of Communication. As part of East London Photomonth, David’s images are on display until the end of this month at a variety of cafes forming the ‘Roman Road Cafe Crawl’. David’s show at Muxima cafe runs until 27th of November. More details here.